This little gem is a Free-Westinghouse. The machine was never "free" but manufactured by a company having that name. Ours was bought in Warner-Robins, Georgia at Mr. Baggett's shop. It is 3/4 size or smaller. Plain and simple. It is very lightweight and has a nice carrying case. Its style is unlike any other we have in our small collection. We were attracted to it primarily because of its small size and portability. At the time we purchased this model we were sewing a lot of quilt patches as we traveled and stayed in motels. 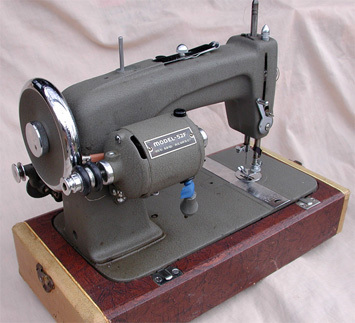 However, at the time of this writing, we have not been successful sewing a good stitch with this machine. Having all of its parts and pieces, it does appear to be operational. The problem is probably a simple matter of getting the tensions adjusted properly. Our problem could also be that we don't have a manual for the unit and we are guessing as to its threading pattern. 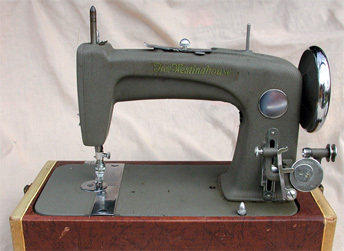 Note the upper-thread tension adjustment on the machine's top. There are several items of interest on the above view. First, note that the motor directly drives the handwheel. There are two small tires that contact the handwheel. Before taking this picture, I forgot to remove the pencil placed between motor and machine to keep he tires off the hand wheel when in storage. This prevents the tires from taking a permanent set which causes an unpleasant sound and vibration when running. Also visible is some blue tape on the motor electrical cable which is bad form. The plug from the motor is unique and requires a special connector. A show stopper would be if the foot control were not with this machine because of this connector. 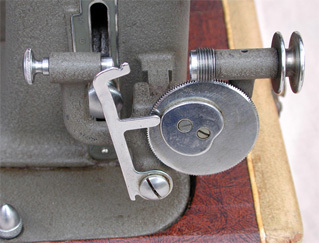 Also seen in in this view is the lever which raises and lowers the presser foot. In our view, it is not as ergonomically designed as others we have used. This style takes some getting to to first locate and then actuate/rotate the lever. Above can be seen the bobbin and bobbin case. 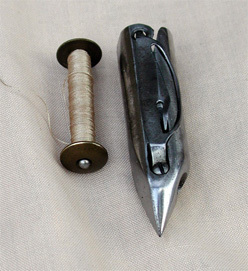 Below is a close-up view of the bobbin winder. Every time we watch the bobbin winder in operation we marvel at the simplicity of engineering involved in laying out the thread on the bobbin so evenly. We don't see how it could get any simpler than this. Wonder if a group of today's college grads in mechanical engineering would arrive at this design if given the same assignment?